I found these boots on the shelf of a thrift store. They were boring black with black stitching, but the price was right. 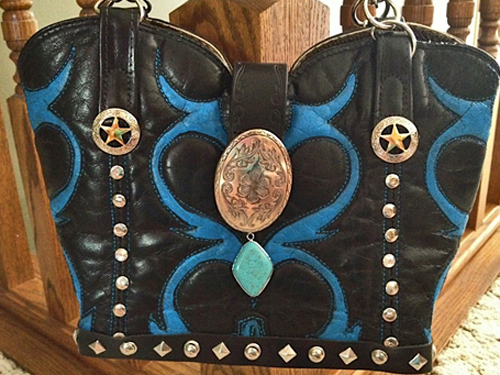 This thrift store was dangerous – I left with these boots, a long black leather skirt that I paid $8 for and will yield many square feet of leather for projects, and a few pieces of western wear that I embellished for our country music event! 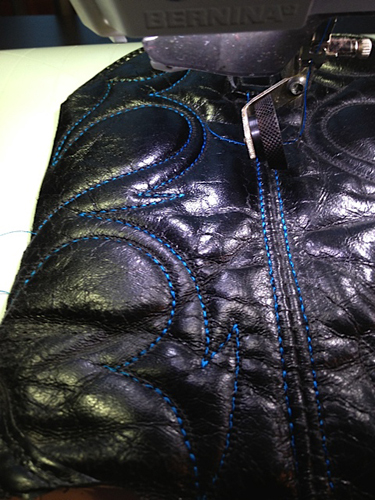 Here you can see I cut the tops off the boots and began by overstitching the boot tops with turquoise thread. 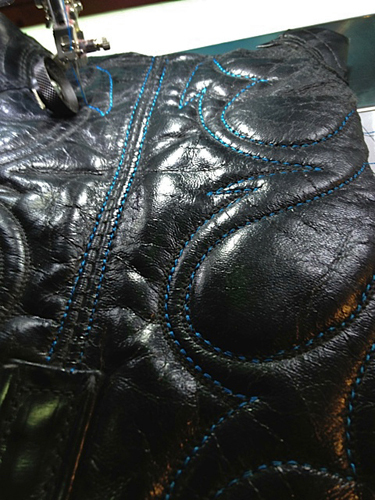 The Leather Roller Foot was perfect for sewing the curves in this part of the project. 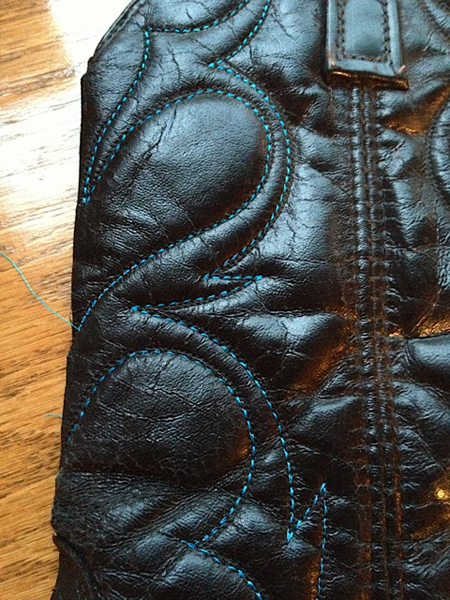 I used a Leather needles and didn’t have a bit of trouble sewing through the layers of leather. Here I continue to add color and interest. The stitching alone wasn’t enough for me so I added some paint as well. Here the outer bag is complete. I added some studs and chonchos. 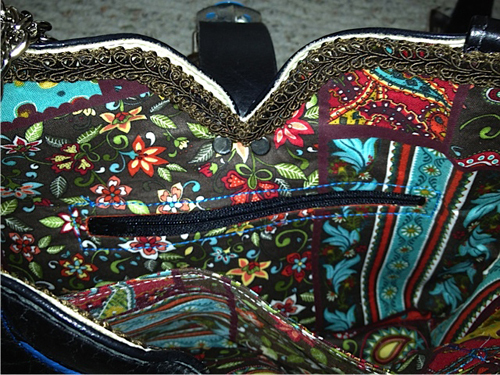 I also added the bags closure made from a belt I found at the thrift store as well. 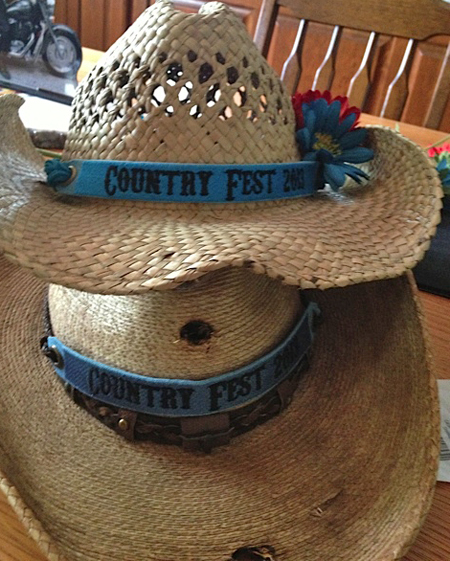 I made some hat bands for our cowboy hats using a truetype font I found free on the internet! One of my favorite features of BERNINA Embroidery Software 6! Here’s the bag completed. 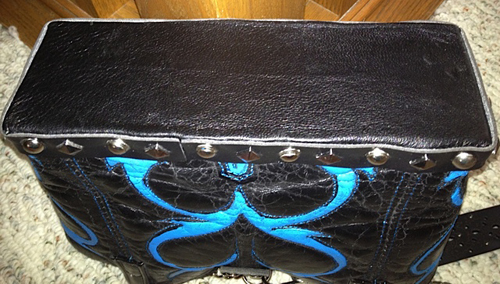 You can see another belt was used to make the strap. This can be removed and two short straps can be clipped on but for ease I wanted a shoulder strap. Here’s the lining. I added one zipper pocket and one patch pocket. 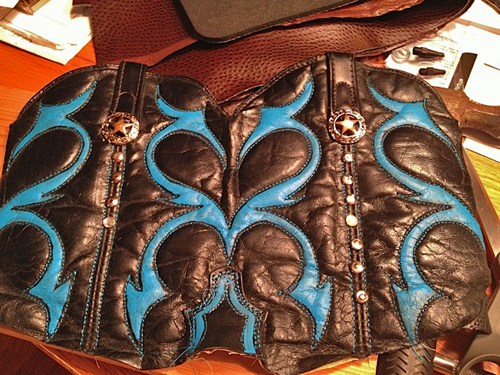 Close up of finished bag. View of bottom. I covered a block of pine with leather and then it glued and tacked it to the purse. 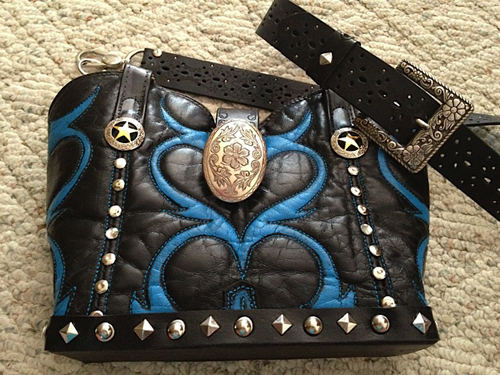 I love the bag and carried it all four days of Countryfest. 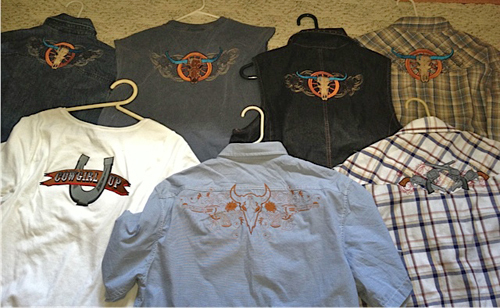 Here is a picture of the clothing I embellished for the group. Most of the shirts were thrift store finds. Most of the designs were from Urban Threads. 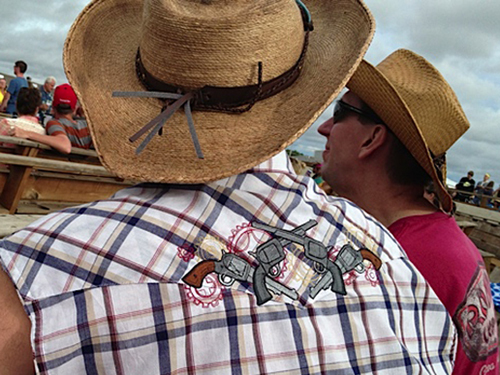 The Cowgirl Up design is from Embroidery Library. My husband and his big guns! Next Next post: Join WeAllSew on Instagram! Ahh-mazing!! 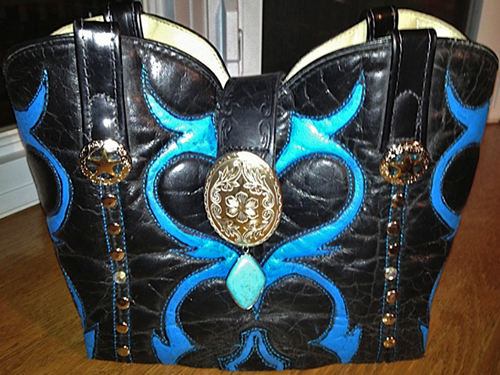 You won’t be able to carry this bag at your country music event without being constantly stopped and asked about it. Thanks for the inspiration. What a neat upcycling idea! I love this great cowgirl material. Horse riding and wearing embroidered products my passion. I have some creative embroidery designs collections of handbags.